To be able to simulate a photovoltaic installation, it is necessary to arrange real equipment available on the market and to compare them based on reliable technical data. archelios Calc™ integrates a multi-manufacturers database for any equipment needed in the production of a photovoltaic installation, which can also be directly enriched by any user. 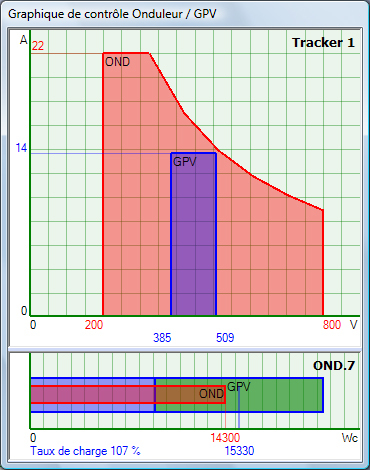 Besides, archelios Calc™ offers dynamic display features which speed up and facilitate photovoltaic simulations. archelios Calc™ is independent of manufacturers and integrates a multi-brands database for the different components of the photovoltaic installations (modules, AC and DC protections, inverters, lightning arresters, cables, AC and DC switches). Find some of the brands of our database on the archelios Calc™ brochure. These catalogs allow you to find easily the equipment that you need You can also personalize them by adding your own references. Any user can share with other users the references created by himself. 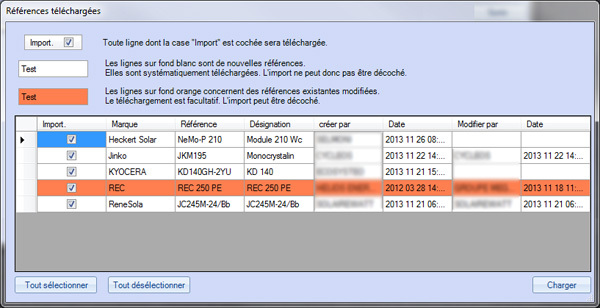 A simple checkbox activates the mutualisation so that all created references are made available to the other users. Any user who ticked this box is informed by the software of the existence of references available for download. Thanks to its automatic pre-filtering function for devices compatible with the installation, archelios Calc™ offers a list of references and catalogues which perfectly matches the specific technical setup defined by the user. This provides users real time gains, even if users are free to search the database by manufacturer, by power or by type. Comparing several references allows you to quote your installation in a precise and optimal way. archelios Calc™ offers photovoltaic simulation features: thus, the match between the photovoltaic generator and the inverter is checked through the generation of a model diagram which can be manually optimized by the user in real time.